Oaxacan artist Francisco Toledo once said, something truly original does not come from novelty but from origin. Sixty-four small gouache paintings by the Rose Compass collective flow through Santa Barbara City Hall’s gallery corridor. A scaled replica of the Santa Ynez River shines below them on the Saltillo tile, an intervention that draws attention to the exhibit’s focus: the origin of the region’s limited and valuable water resources. The six Rose Compass artists are Connie Connally, Holli Harmon, Libby Smith, Nicole Strasburg, Nina Warner and Pamela Zwehl-Burke, each artist contributing a factor to an elegant composite. The emphasis on numbers in the show’s title, “The River's Journey: One Year, Six Artists, Ninety-Two Miles,” is as much a nod to the multidimensionality of the endeavor—four exhibits and a book—as to the details themselves—with dozens of distinct depictions from the valley to the ocean in a variety of unique artistic styles, all bound together by the common theme and the color palette of the Central Coast landscape. The repetition of subject matter from different points of view references a Cubist assemblage, while harboring the detective’s sense of searching for the river’s secret story. “Gibraltor as a Victorian Tub,” Holli Harmon’s painting of a bathtub overlaying the river’s path reveals part of this hidden story—the oft-ghostly imprint of human culture on the vast landscape. As the image of the translucent tub competes with the power of the river, the viewer must consider how in nature, one either finds or loses oneself. While Santa Barbara and Ventura counties grapple with the declining supply of clean drinking water, the Rose Compass exhibit draws forth the living connection between past and future, landscape and culture. 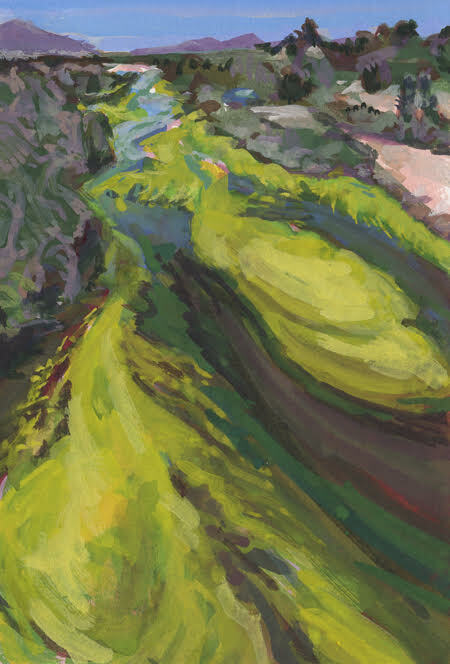 In "The River's Journey," the organic web of Santa Barbara’s waterways and watersheds flows from the gouache on paper and into the arteries of the viewer. “The River’s Journey” was originally produced for the Wildling Museum in Solvang. The exhibit at Santa Barbara City Hall was produced as a partnership between the City of Santa Barbara and Rose Compass and is on view from Sept. 6, 2018 to March 30, 2019 at City Hall Gallery, 735 Anacapa St., Santa Barbara. 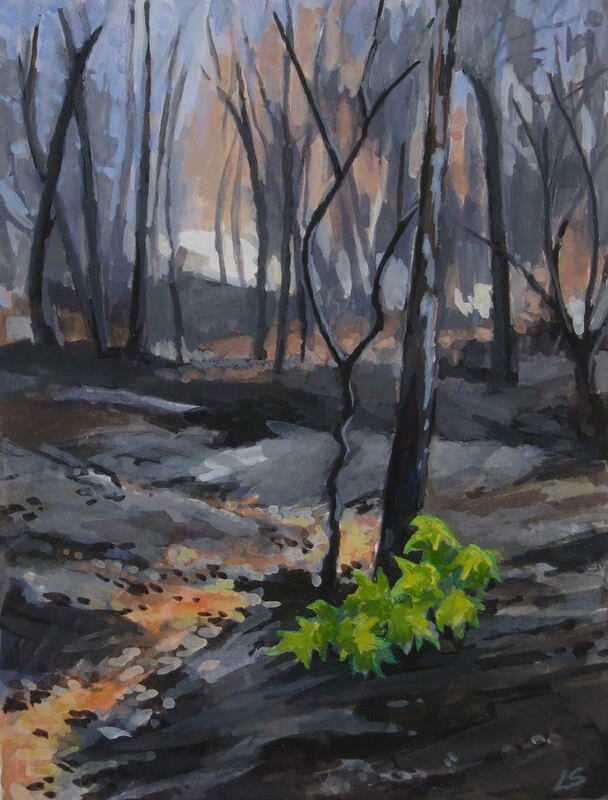 Rose Compass will exhibit works from "The River's Journey" at Sullivan Goss – An American Gallery in October of 2018 and Westmont Museum in January of 2019.